Errea Sport & ADO Den Haag to work together until 2024! Home / International Football / Europe / Errea Sport & ADO Den Haag to work together until 2024! Erreà Sports and Dutch Eredivisie side ADO Den Haag continue with each other for six years. The successful cooperation with the clothing supplier has been extended until the summer of 2024. Since the 2011/2012 season, the shirts and clothing of ADO Den Haag have been supplied by the Italian brand. 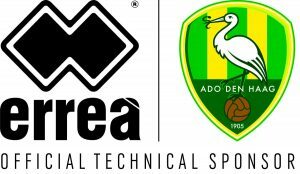 When the new contract ends in 2024, Errea will have been the official clothing partner of ADO Den Haag for thirteen seasons. Pierpaolo Lanzi, Export Manager, and Reinier Hartman, Managing Director of Erreà Netherlands, are very pleased with the renewal of the contract. Erreà Netherlands would like to expand their business in the Hague area. Therefore Erreà Netherlands opened on February 1, 2018 their new showroom in the Cars Jeans Stadium, Skybox 4.03. Erreà Netherlands will welcome and invite here existing and new sport clubs, associations and their Dutch business partners. In the new showroom the full collection of Erreà will be presented and during ADO training sessions or home matches their customers can see, feel and touch the unique collection. Previous India Women coach Maymol Rocky: First match against Nepal extremely crucial! Next VIDEO – FC Goa: Gaur Talk with Mohammad Nawaz!